Chemicals maker Huntsman Corp. has ended its $6.5 billion agreement to be taken over by Hexion Specialty Chemicals Inc. and agreed to a $1 billion legal settlement with Hexion's private equity owner, Apollo Global Management. Apollo-owned Hexion agreed to buy Salt Lake City-based Huntsman in July 2007 for $6.5 billion but then tried to back out, citing Huntsman's deteriorating finances. The $1 billion settlement includes a $325 million breakup fee to be paid as provided in the merger agreement -- which Hexion expects will be funded by Credit Suisse and Deutsche Bank -- and $425 million cash payments made by certain affiliates of Apollo. Huntsman also will receive another $250 million in exchange for 10-year convertible notes which can be repaid in cash when they mature or in common stock. Huntsman said it expects to receive at least $500 million before the end of the year, with the rest paid by March 31. Indian industry saw its output shrink for the first time in 15 years with a 0.4 per cent year-on-year decline in October, as the impact of the global economic downturn deepened in the country. From a dazzling 12.2 per cent growth in October last year, industry recorded a negative growth of 0.4 per cent in October this year, partly due to a dip of over 12 per cent in India's exports. The fall was bigger than expected and lets hope that the December 7 stimulus package would arrest any further decline though looks unlikely. 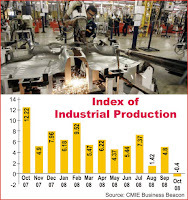 Industrial output had last fallen in April 1993. Manufacturing, comprising around 80 per cent of the Index of Industrial Production, (IIP) clocked a negative 1.2 per cent growth in the month from a whopping 13.8 per cent a year ago. In fact, output in two of the four sectors that make up the index -- intermediate goods and consumer goods -- contracted to 3.7 per cent and 2.3 per cent, respectively, from a growth of 13.9 per cent and 13.7 per cent, respectively. Within consumer durable goods, both segments -- consumer durables and consumer non-durables -- shrank by three per cent and two per cent, respectively. Of the total 17 industries, captured in the IIP figure, as many as 10 recorded a negative growth and could have a similar bearing on economic growth, given the fact that industry accounts for 29.4 per cent of GDP. Besides manufacturing, mining growth fell by 2.8 per cent, from 5.1 per cent in October, 2007. Electricity, however, proved to be a consolation with growth rate rising to 4.4 per cent from 4.2 per cent. Of the industry segments, leather and fur products shrunk the maximum by 18.1 per cent, followed by food and wood, furniture and fixtures by 14.4 per cent and cotton textiles by 9.6 per cent. Seven industry which registered a growth, included beverages, tobacco, paper and paper products, printing and publishing, rubber and plastics and basic metals. For the first seven months of this fiscal, industrial growth rate more than halved to 4.1 per cent from 9.9 per cent in the corresponding period a year ago. The slowdown follows the impact of global financial crisis which has pushed economies of developed countries like the US, the UK, Euro zones nations and Japan into recession. In fact, Asian Development Bank has already scaled down India's growth projection to 7 per cent for 2008 from the earlier estimate of 7.4 per cent. For 2009, the economy is likely to grow at 6.5 per cent, ADB said. Even in my remote bit of paradise, news of distant disasters filters through: above the steady sound of waves breaking on the sandy beach in Sri Lanka, I was informed by several news channels about the sickening attacks on Mumbai. My Internet connection is erratic and slow, but nevertheless, I have been bombarded with emails, asking me for my take on this latest atrocity. Over the last few years, I have travelled to several countries across four continents. Everywhere I go, I am asked why Pakistan is now the focal point of Islamic extremism and terrorism, and why successive governments have allowed this cancer to fester and grow. As a Pakistani, it is obviously embarrassing to be put on the spot, but I can see why people everywhere are concerned. In virtually every Islamic terrorist plot, whether it is successful or not, there is a Pakistani angle. Often, foreign terrorists have trained at camps in the tribal areas; others have been brainwashed in madressahs; and many more have been radicalised by the poisonous teachings of so-called religious leaders. Madeline Albright, the ex-US secretary of state, has called Pakistan ‘an international migraine’, saying it was a cause for global concern as it had nuclear weapons, terrorism, religious extremists, corruption, extreme poverty, and was located in a very important part of the world. While none of this makes pleasant reading for a Pakistani, Ms Albright’s summation is hard to refute. Often, the truth is painful, but most Pakistanis refuse to see it. Instead of confronting reality, we are in a permanent state of denial. This ostrich-like posture has made things even worse. Most Pakistanis, when presented with the fact that our country is now the breeding ground for the most violent ideologies, and the most vicious gangs of thugs who kill in the name of religion, go back in history to explain and justify their presence in our country. They refer to the Afghan war, and the creation of an army of holy warriors to fight the Soviets in Afghanistan. Then they go on to complain that the Americans quit the region soon after the Soviets did, leaving us saddled with the problem of jihadi fighters from all over the Muslim world camped on our soil. What we conveniently forget is that for most of the last two decades, the army and the ISI used these very jihadis to further their agenda in Kashmir and Afghanistan. This long official link has given various terror groups legitimacy and a domestic base that has now come to haunt us. Another aspect to this problem is the support these extremists enjoy among conservative Pakistani and Arab donors. Claiming they are fighting for Islamic causes, they attract significant amounts from Muslim businessmen here and abroad. And almost certainly, they also benefited from official Saudi largesse until 9/11. Now that government policy is to distance itself from these jihadis, we find that many retired army officers have continued to train them in camps being run in many parts of Pakistan. A few weeks ago, Sheikh Rashid Ahmed, a prominent (and very loud) minister under both Nawaz Sharif and Musharraf, openly boasted on TV of running a camp for Kashmiri fighters on his own land just outside Rawalpindi a few years ago. If such camps can be set up a few miles from army headquarters, what’s to stop them from operating in remote areas? Many foreign and local journalists have exposed aspects of the terror network that has long flourished in Pakistan. Names, dates and addresses have been published and broadcast. But each allegation has been met with a brazen denial from every level of officialdom. Just as we denied the existence of our nuclear weapons programme for years, so too do we refuse to accept the presence of extremist terrorists. For years, it suited the army and the ISI to secretly harbour and support these groups in Pakistan, Kashmir and Afghanistan. While officially denying that they had anything to do with these jihadis, money and arms from secret sources would reach them regularly. Despite our spooks maintaining plausible deniability, enough information about this covert support for jihadis has emerged for the fig-leaf to slip. And even if the intelligence community has now cut its links with these terrorists, the genie is out of the bottle. Each time an atrocity like Mumbai occurs, and Pakistan is accused of being involved, the defensive mantra chanted by the chorus of official spokesmen is: “Show us the proof.” The reality is that in terrorist operations planned in secret, there is not much of a paper trail left behind. Nine times out of ten, the perpetrators do not survive to give evidence before a court. But in this case, one terrorist did survive, and Ajmal Amir Kamal’s story points to Lashkar-e-Tayyaba. The sophistication of the attack is testimony to careful planning and rigorous training. This was no hit-and-run operation, but was intended to cause the maximum loss of life. Pakistan’s foreign minister said that Pakistan, too, is a victim of terrorism. While this is certainly true, the rest of the world wants to know whey we aren’t doing more to root out the training camps, and lock up those involved. Given the vast un-audited amounts from the exchequer sundry intelligence agencies lay claim to, their failure to be more effective against internal terrorism is either a sign of incompetence, or of criminal collusion. Benazir Bhutto’s murder, after an earlier attempt and many warnings, is a reminder of how poorly we are served by our intelligence agencies. And while the diplomatic fallout from the Mumbai attack spreads and threatens to escalate into an armed confrontation, the biggest winners are those who carried out the butchery of so many innocent people. It is to their advantage to prevent India and Pakistan from coordinating their fight against terrorism. Tension between the two neighbours suits them, while peace and cooperation threatens their very existence. The world is naturally concerned about the danger posed by these terror groups to other countries. However, the biggest threat they pose is to Pakistan itself. Until Pakistanis grasp this brutal reality and muster up the resolve necessary to crush them, these killers will tear the country apart. Hong Kong's Central district is Asia's most expensive shopping area, with street-front retail space costing $775 per square foot a year to rent.Central beat Causeway Bay, Hong Kong's traditional shopping district and last year's number one, and Tokyo's Ginza, this year's second-most expensive shopping area in Asia. The Central district ranked seventh worldwide after New York's Fifth Avenue, Paris's Champs Elysees, Moscow's Tverskaya, London's Bond Street and Oxford Street and Dublin's Grafton Street. Since the arrival in Central last year of Swedish chain Hennes & Mauritz AB, overseas retailers have sought space in the area to boost brand awareness among affluent mainland Chinese visitors.